First things first. I want to revise that theory I proposed in the last blog about why Latin Americans are always late. Actually, it wasn’t my theory, so it’s not my responsibility to revise, but I have a different theory to posit. Another friend of mine who studied abroad in Africa pointed out the same trend there, but then she noted that there are seasons in parts of Africa which make it really critical to plan ahead, yet people don’t in other aspects of their lives. And so, seasons may not be the culprit. Instead, I hypothesize that Americans and Europeans are culturally more time-sensitive because of our role in the industrial revolution. You may know that our modern time keeping system, including time zones, came about as a result of the construction of the transcontinental railroad. Before that time, time was not super important, but as soon as a train could make it between major cities in a number of hours, it became critical to keep closer track of time, so that one could arrive to the station on time, and so that the train would be on schedule. So, my hypothesis goes: Civilizations that were not part of the industrial revolution did not have the same impetus to start caring about time in the way that Americans and Europeans do. So there we have it. What do you think? Ok, now on to Cartagena. 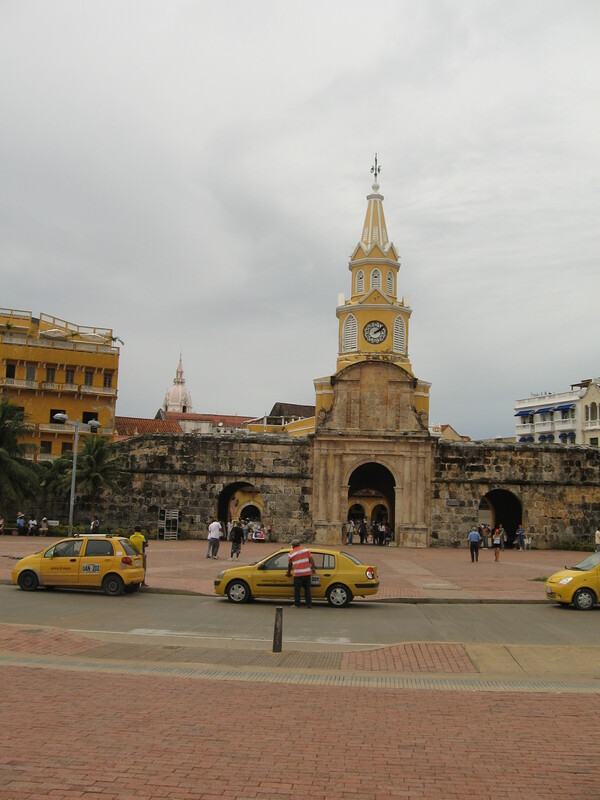 After three days with international friend and family in Medellin, I hopped on a plane to Cartagena, the colonial city and UNESCO World Heritage site on the Caribbean coast of Colombia. 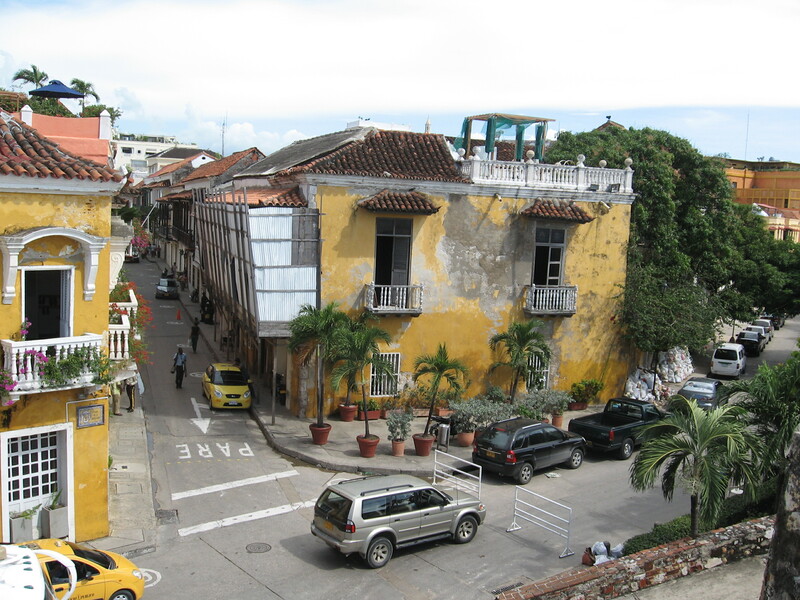 Cartagena was founded in 1533 and went on to become one of the three most important Spanish ports in the West Indies. It has the most extensive fortifications in all of South America the construction of which began in 1586 and was completed in the 17th century. Throughout the Spanish period, the city was attacked numerous times, but the fortifications were never breached. In 1811, Cartagena declared independence from Spain. It´s a gorgeous city, if a bit touristy. I saw lots and lots of tours coming off of cruise ships while I was there. However, as a lone traveler staying in a hostel, the city felt very normal. It is a real city where real people live real lives that just happen to criss-cross with a lot of tours. I really enjoyed being there by myself and having the freedom to explore on my own. I spent about a day and a half of my time there just walking around the old city and walking the perimeter of the city wall. In addition, I spent part of a day exploring with a guy from North Carolina that I ran into on the street. He owns a McDonald´s franchise in Raleigh and was on vacation traveling with friends. We went to the Cartagena museum of history after walking part of the wall. 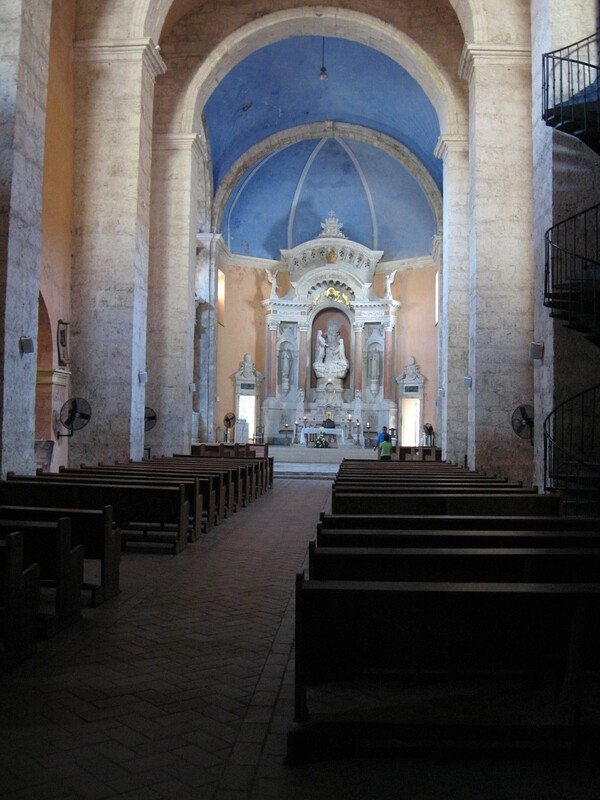 He wasn’t really excited by church, while I LOVE churches, so after we parted ways I went church-hopping. 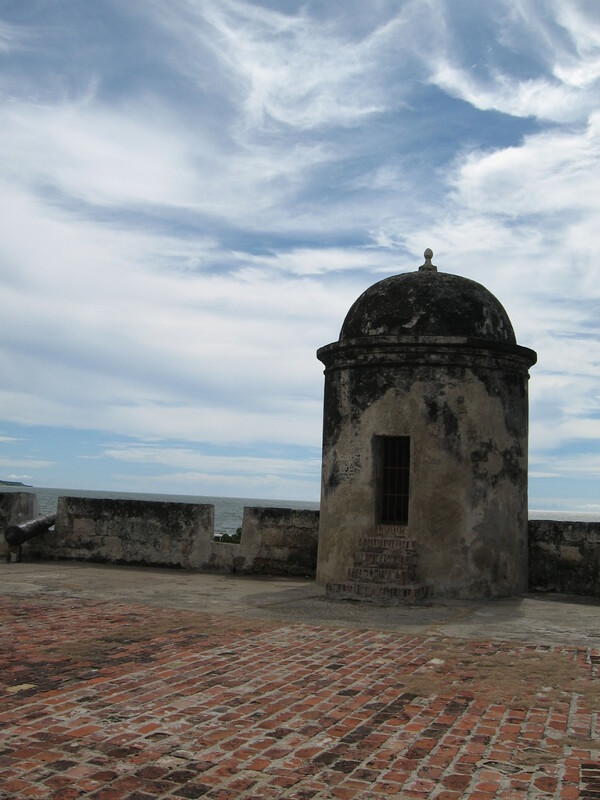 My favorite was Iglesia Santo Domingo And the next day, I walked beyond the old city to El Castillo de San Felipe, a fort that guards the back side of the city of Cartagena. Castillo de San Felipe is not the most attractive fort I’ve ever seen (that would have to be the star-shaped fort in Kinsail, Ireland), but it was impressive and imposing none the less. The hike to the top offers a nice view of Cartagena and there are some neat tunnels through the fort for the non-claustrophobic explorer. 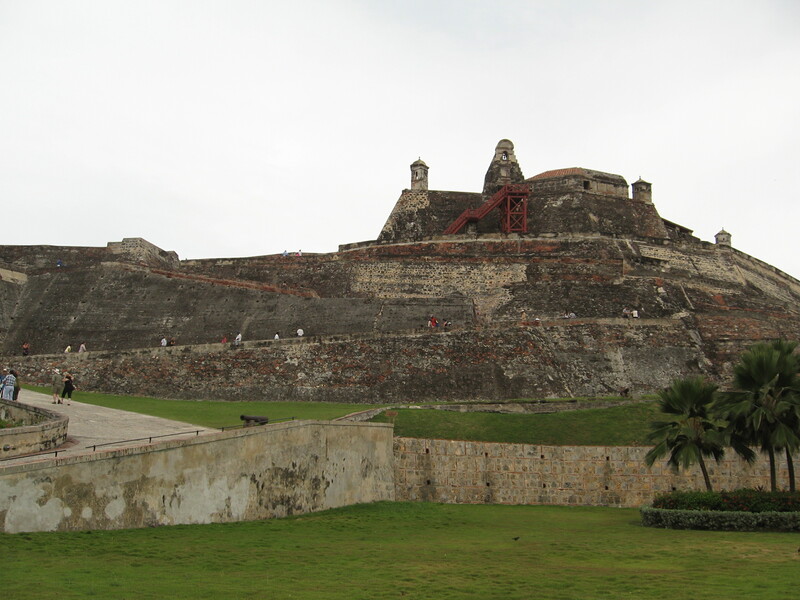 As you may have guessed, Cartagena, being a Caribbean coastal city, was quite hot and humid. I´m generally not a huge fan of heat and humidity, but I was actually excited for it because Quito had been really cold (like 50 degrees F) and rainy the entire week before I left. Three days was just enough for the heat and for the sight-seeing in general. Had I planned to go on a snorkeling excursion or something, I might have wanted more time there, but just to explore the city, three days was about right. Moving on to Cartagena from Medellin also meant moving on from the comfort and security of being with friends. This may sound like a funny thing for me to say, given all of my travel experience, but this trip was another test for me in traveling alone. You know that last year I came to Ecuador by myself for nearly two months; however, I was stationary for large parts of that trip and staying with host families. And the last two weeks that I did spend on the move, I was with a former college roommate. After leaving Medellin, I was on my own, moving/living in hostels for six days. That means doing things alone during the day, eating alone, going out alone, etc…. Certainly, you meet other people in the hostels or at tourist attractions that provide company, like the McDonald’s franchise owner, but you aren’t always on the same schedule or the same budget. For example, I ate out a lot more than most of the other guests, because I was on a more generous budget. In addition, many of the other guests started drinking at the hostel as early as 5 or 6 pm before going out to drink some more at around 9:30pm — not really my style. I like churches and museums, most other 20-something travelers don’t. And of course, not very many women travel alone. In fact, most of the travelers are on vacation in couples, or sometimes traveling with friends. And most are at various points in 4- to 8-months itineraries moving through all or part of South America, not just one country — hence the budget difference. I definitely couldn’t stand to do that alone. I did enjoy those six days testing myself to go out to a restaurant and eat lunch and dinner alone everyday — which reminds me of a cute YouTube video about being alone that I wanted to share. Well, that’s all for Cartagena. Stay tuned for the last installment of my Colombia vacation: Bogotá. Coming this weekend, hopefully! 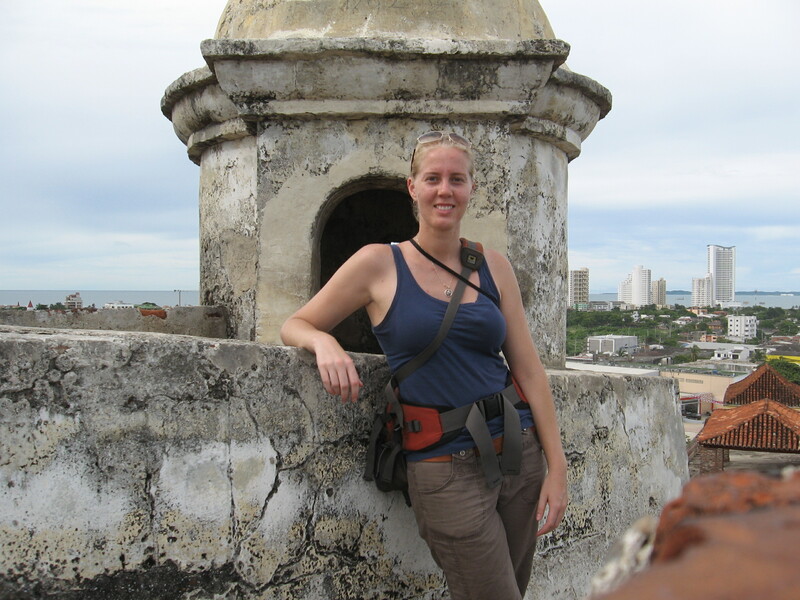 Well, now I’ve been to Cartagena, thanks to you, Rachel! I enjoyed it.